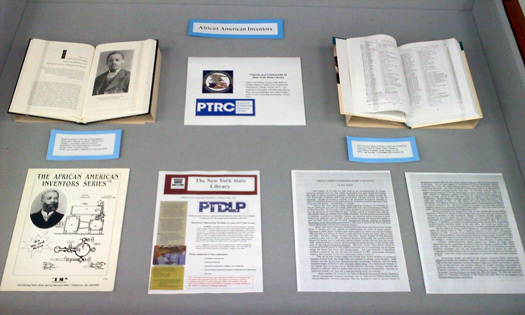 In honor of African-American History Month, the February 2012 public floor exhibit was about African-American inventors. From the earliest times, African Americans have contributed to the inventive spirit in America. 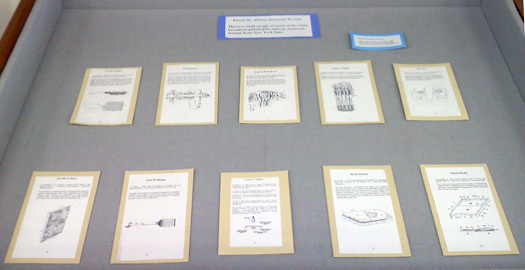 A very few examples of the many inventions African-American men and women have patented are displayed. These include items such as kitchen scrubbers, electric railways, portable cashiers, methods of strengthening hair, and home security systems. Granville T. Woods, born in Columbus, Ohio in 1856, was known as the "Black Edison." During his lifetime he received over 30 patents and successfully fought suits brought against him by Thomas Edison for the rights to certain electrical inventions, including railway telegraphy (patent no. 388,803), which allowed dispatchers to communicate by telegraph and warn train engineers of oncoming trains. Another of Wood's better-known inventions is the air brake (patent no. 701,981). Lewis Latimer, another African-American inventor, invented an incandescent lamp, as well as a water closet. Lewis Latimer later joined Thomas Edison's firm. Judy W. Reed, of Washington, D.C., and Sarah E. Goode, of Chicago, were the first African-American women inventors to receive patents, but many New Yorkers, including some from the Capital Region, soon joined them. Dr. Patricia Bath, an ophthalmologist from New York, but living in Los Angeles when she received her patent, became the first African-American woman doctor to receive a patent for a medical invention. Dr. Bath's patent (no. 4,744,360), a method for removing cataract lenses, transformed eye surgery, using a laser device to make the procedure more accurate. 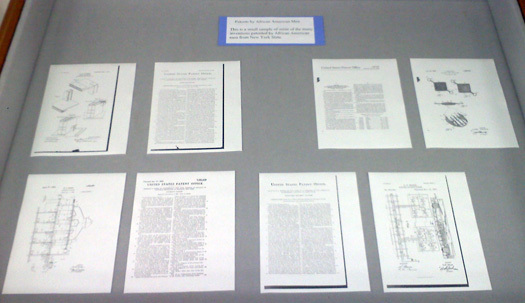 Also displayed were some of the resources the State Library has on patents. A Patent and Trademark Resource Center since 1871, the New York State Library has an extensive collection of patent and trademark materials.